Tirta Gangga, formerly a Karangasem royal water palace located in east Bali. 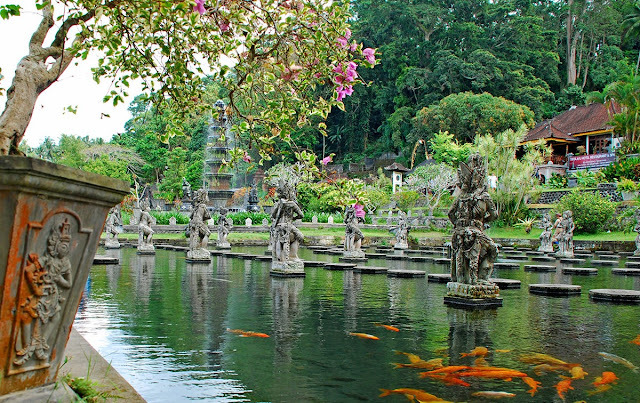 Currently, Tirta Gangga Karangasem park serves as a tourist spot in eastern Bali. 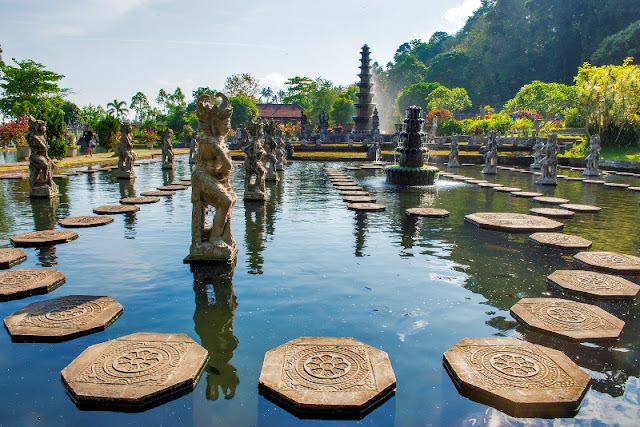 Tirta Gangga Bali tourist attraction is located in Karangasem regency, a district located in eastern Bali. If you stay in Kuta, you will take 2 hours by car. 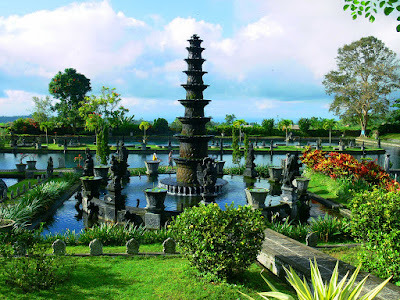 There are three main things in the water palace Tirta Gangga Karangasem, gardens, water ponds, and statues. The location of the Tirta Gangga Karangasem park, located in the middle of rice fields and water in this park comes from the spring of Rejasa. This park still belongs to the kingdom of Karangasem. 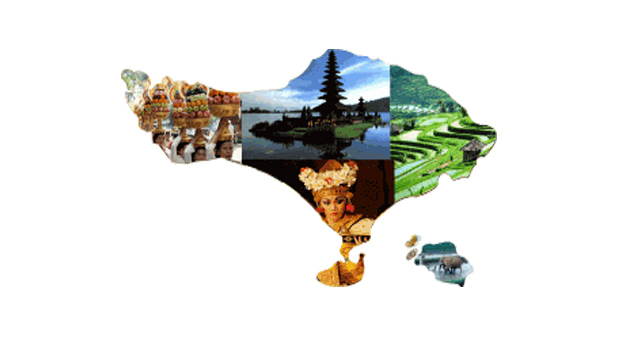 The total area of the park is 1.2 hectares of Tirtagangga, which extends and extends from east to west. There are three levels of buildings in the garden of Tirtagangga Bali. In the highest building, there is a spring under the banyan tree. Building the second level, there is a swimming pool and the building at the bottom there is an ornamental pond with a fountain. At the time tourists enter the water palace of Tirtagangga, the first thing tourists see is the expanse of a pool of water and there is a temple towering on the right. Inside the water pool, tourists can see the ornamental fish and the base of the pond. The water in this garden is very clear and cool because the pond water comes from springs instead of water processed. The spring in Tirtagangga garden by local people is considered holy water. Used in religious ceremonies in the area around the garden of Tirtagangga. 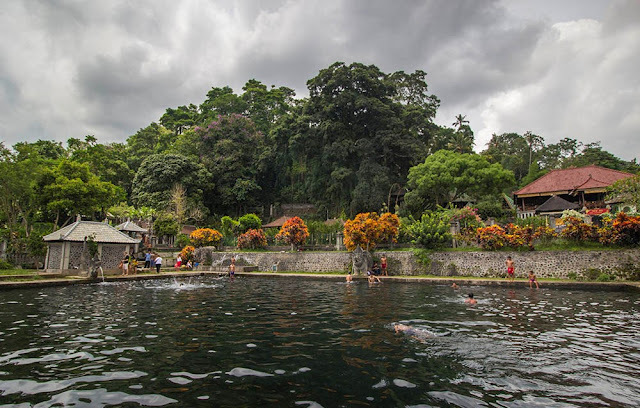 Mata Rejasa Water has a very large amount of water, clear and soothing. One-third of Rejasa's supply of springs is sent to people's homes in Amlapura City (the capital of Karangasem) and two-thirds are used to fill the ponds and the output from pond water is directly used for agriculture. Swimming in Tirta Gangga water pool, the water is very cool and clear. It feels completely different from swimming in a man-made pool. I suggest if you take a vacation to Tirta Gangga tourist attraction, to take a swim in this pool. You must bring a change of clothes and a towel, if planning to try swimming. The name of Tirta Gangga tourist attraction, comes from the word Tirta which means holy water and Ganga which means the name of the river in India. The water palace of Tirtagangga Karangasem, built in 1946 by the king of Karangasem, Anak Agung Anglurah Ketut Karangasem Agung. The park complex of Tirta Gangga Karangasem was previously destroyed by the eruption of Mount Agung in 1963. The district government of Karangasem rebuilds this park and is destined for tourist area. From the first time entering the main gate, tourists will be greeted by some statues that seem to march like a soldier. Tourists can walk the path over the pond through a stone walkway arranged in rows like a bridge. This stone is arranged in the form of hexagon. In addition to walking around the pool, tourists can also take pictures both selfie and pre-wedding. This part of the pool is most fitting to take pictures, because in addition to the view of a natural pool, sculpture statue that is in the pool will also beautify the background of the photo and appear to have more character. 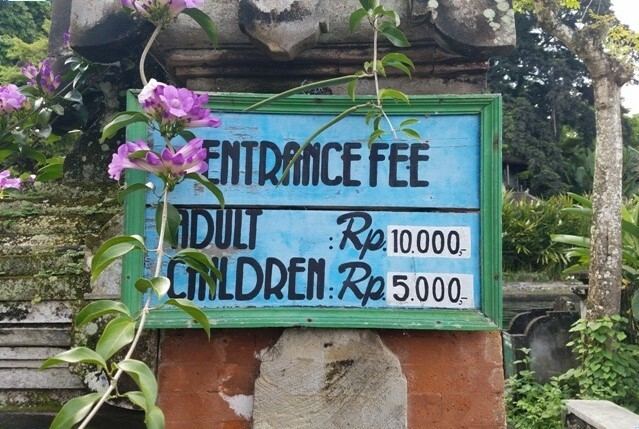 To be able to enter the attractions Tirtagangga, you will be charged entrance fee of 10000 rupiah for adults and 5000 rupiah for children. If you want to swim, an additional charge of Rp 6,000 per person will be charged.